Will be running weekly giveaways all the way until baby Michael arrives. And during the week he's born, the giveaway will be sponsored by Haakaa. Whoop!! And last week we had a maternity photoshoot! My first! Cos I didn't get to do one when pregnant with Myla cos she arrived before the scheduled shoot. Can't wait to see the pics and share it with you too. 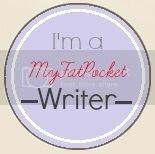 Meanwhile, have you read my latest articles on MyFatPocket? Things that make a man attractive to me. 5 Ideas to Prank your Man.